In order to monitor calls, you must have Monitoring Permissions given to you by a super admin. If you don't have these permissions, contact your super admin for assistance. Enter the extension you would like to monitor (only lines provisioned on a single device can be monitored). Enter your Dialable Password (4 digits). This password is separate from your voicemail password and can be configured/changed by an administrator or by dialing *19 from your phone (default 0000). During the call, press one of the following to enter different monitoring modes (see below for details). Far End (A) – The party to whom the target is speaking (may be another Jive extension, an external number, etc). Target (B) – The line that is to be monitored. Monitor (C) – The Jive user who dialed *17 to monitor a call. No one is aware that the monitor is listening to the call. Allows for supervisors/etc to listen in on system phone calls. This is often used for quality assurance/etc purposes. 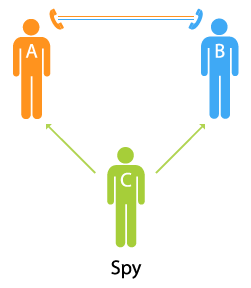 In the illustration below, neither A nor B can hear C, but C can hear both. 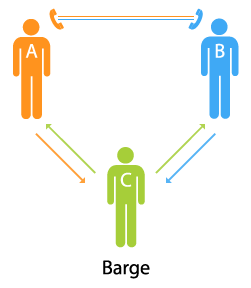 Monitor (C) can speak with the target (B) only; the far end (A) will not hear the monitor (C). Allows for collaborative telephone calls, when it is not optimal for that collaboration to be obvious to the far end. This is often used for employee training, etc. 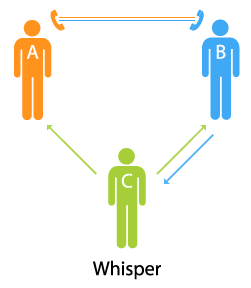 In the illustration below, C can speak to B without A hearing. So B and C can hear everyone, but A can only hear B. All three parties hear each other (essentially forcing a three-way conference call). In the illustration below, everyone can hear everyone.